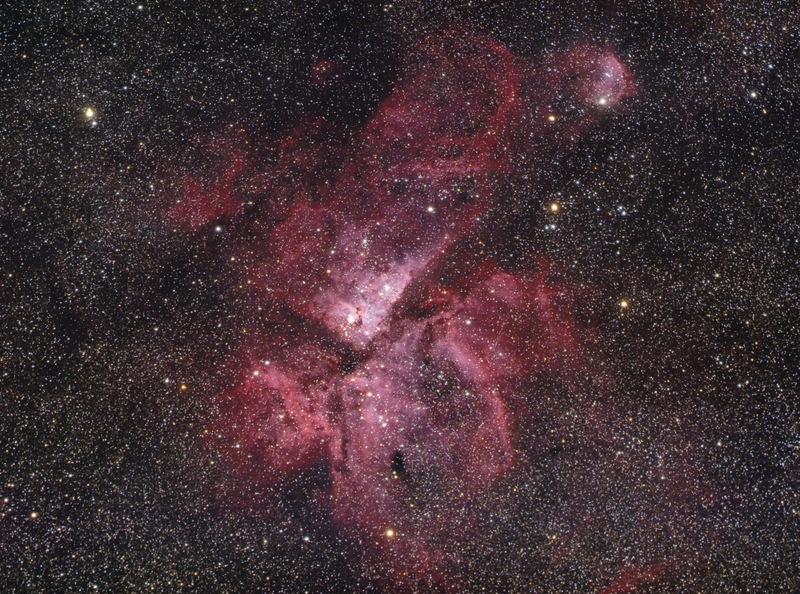 NGC 3372, known as the Eta Carina Nebula is one of the largest and brightest diffuse nebula in the sky. Being 4 times larger and much brighter than the famous Orion nebula, Eta Carina is less well known due to its location is the far southern sky. The central part of the nebula is called the Keyhole Nebula a famous dark area which in binoculars looks like three fan shaped areas. This object is nearly impossible to view and image from North America unless your along the extreme southern border, in this case, the FL Keys where the object rises about 7 deg above the horizon. This image was taken on an extremely clear and transparent night at the 2017 Winter Star Party in Scout Key Fl at an average altitude of 5 deg above the horizon. It combines 1hr worth of 2 min exposures using a Stellarvue SV70 refractor and Canon 60Da camera mounted on a Astrotrac portable pier system.